It took quite a while, but I finally found a window of time to produce a new build for the game with some bug fixes and a handful of new additions! Nothing huge, though. The next “big” update, containing new features, will most likely occur on August 1st…unless some kind of catastrophe gets in the way, like receiving another avalanche of annoying e-mails. Fixed bug that would cause Yandere-chan’s fingers to deform in strange ways when she raised her phone camera (thanks to help from Saracen again). 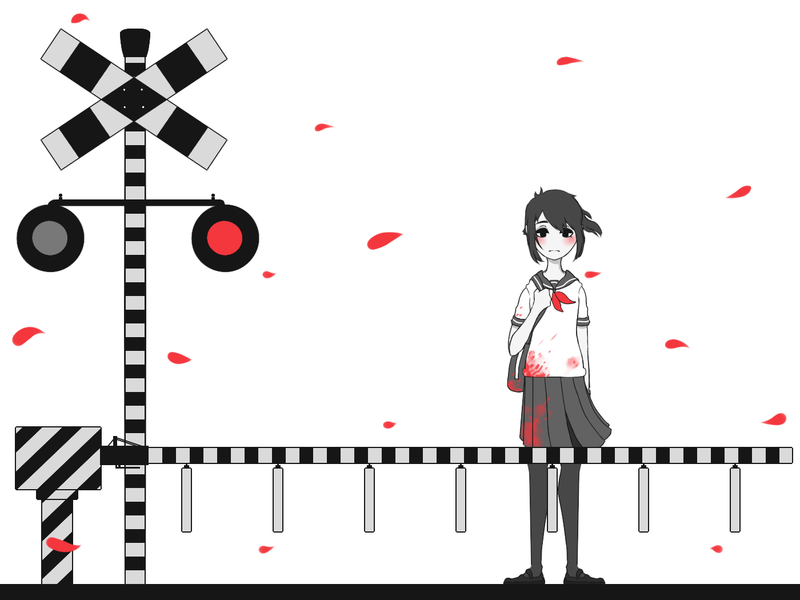 Fixed a bug that would prevent Yandere-chan from picking up items that were dropped near the small gate nearby the school entrance. Fixed bug that would cause the “Caution” symbol to appear onscreen even when Yandere-chan was holding a non-suspicious object. Made the options at the Game Over screen grow and shrink when selected / deselected. Fixed another bug that could result in the “only Senpai comes to school” scenario. Attempted to fix the “teachers get stuck on doorways” bug. Added several new accessories for Yandere-chan. Added several new sponsors to the game. I’m excited for the 1st too, but also because it’s my birthday that day! There is no StreamingAssets folder. Upon going to school, the game freezes. Ok, that’s 4 people in 7 comments stating the very same thing. How about now we all stop repeating ourselves and a) wait for the Dev to eventually notice and fix the problem or b) wait for the June 1st build? Oops! I don’t know what went wrong. Try the new download link? Yandere Dev, can you add a batarang as a weapon to the game ? And also add Unity-Chan to the game. I think if a teacher sees you visibly insane, she would send you to the counselor’s office and it would waste your time in the game. Please add my ideas. Thank you in advance. Your game is the best ! Could you look at fixing the floor in the school please? Its too bright. I noticed Pewdiepie had a bright floor on his latest video too. The floor and the stairs are kinda bright now. It looks so unnatural in the school. Unless of course its intentional. If so nevermind. Great to see another build out. I’m gonna make a suggestion that is up for discussion with anyone here. Being around pools most of they day made me think, “There should be a pool in Yandere Simulator.” There are Japanese highschool’s with pools, so why not? This could add to the special events like a firework festival, sports festival, or swimming things. You could push in a girl who isn’t good at swimming into the deep end and let her drown. The staff would assume it was accident since she isn’t a swimmer. Something like that. Also school swimsuits. So many pros. Only con would be the amount of work required to add it and the water could possibly break the game again. He’s already said he’s going to add a pool. I’m just waiting on the build that adds in the 2000 Los Angeles Lakers. I want killing and disposing of stuff to be more difficult. You just have the clean uniform and the icinerator at school’s entry xD. What if you had to find a lighter to burn the corpses by yourself or to hide them in a bag or something and then throw them into a trash container? Or to go to a dresser to put yourself clean clothes after murdering someone with the risk that someone sees you all bloody while going? Wouldn’t that be funnier? Also having to go to the bathroom or the janitor’s room to get the mop so you can sweep the blood, and not having it right next to the school gate. Then you’d have to find the janitor’s room key and stuff to be able to do that, with the risks that brings. Yeah, that’d make the game definitely more lively. And want the nurse to be programmed so she notices if you pick the siringe and the tranquilizer, so you’d have to make up something to get her out of the nurse’s office and then pick ’em. Yes, that would be nice. I hope you to see my comment and consider it, and if you’ve already thought about that then go on. And can’t wait to see the rival programmed and the swimming pool (more killing options are always well welcomed)! Each update has made the game harder/more complicated so far. I don’t think it’ll be as simple as press a button, drag, rinse and repeat in the final version. Almost everything you said is already planned as well, so that’s something to look forward to. And if you reach a high level at literature, would be nice that you could write fake goodbye notes pretending that someone you’ve killed, disposed of her/his corpse and her/his blood has moved to another city or left his home because he/she couldn’t stand her/his familiar situation (that could be related to the conversations about domestic abuse they have at the rooftop). And with that I’m saying I want people to notice that girl/boy disappeared and be sad and worried for that. And if you leave the fake goodbye (move) note then her/his friends are more calm “knowing” she/he is safe or mad for leaving without saying anything. And the student’s parents should notice she/he is left too and call the police to go and investigate her/his disappearance, and if you don’t leave the fake note the police can suspect of murder, but with that note that problem is solved and Yandere-chan is safe from being arrested. ^That also can be made when you kidnap a girl or boy to get rid of any kidnap suspect by the police. Also, what if you put Jinx’s hair? She’s a crazy character from the game League of Legends and I think it’d be awesome. She has two long braids behind her back and an eleved bang at a side. Blue-haired. So….how can you talk to senpai….and when you go to yandere vision the girl next to the tree and the nurse are highlighted red….senpai can change from pink to yellow then back to pink or juat stay in yellow and some are highlighted blue and some are highlighted green….what does all this mean can i please have color code of what this all means….thanks…. But im confused on the yandere vision part…. Well one thing isn’t in the update list here. Yandere-chan switched from leggings to stockings. This is a huge development YandereDev, how could you not mention this! ?